Iceland is a country filled with take-your-breath-away landscapes that vary from massive blue glaciers to black sand beaches and colorful moss-covered lava fields to misty waterfalls. Since our first trip to Iceland four years ago, it’s become a country easily accessible to travelers with many of them taking advantage of Icelandair’s free stopover. Most explore the not-so-off-the-beaten-path Golden Circle and others venture along the South Coast as far as the famous Jökulsárlón Lagoon. But less than 30% head to Iceland’s Snæfellsnes Peninsula. The Snæfellsnes Peninsula is a photographer’s dream with dramatic sea cliffs, a volcano that served as the setting for Jules Verne’s Journey to the Center of the Earth and sweeping golden beaches. Even if you can’t pronounce it (but really, what Icelandic names can you actually pronounce? ), the Snæfellsnes Peninsula shouldn’t be missed and the best way to explore it is undoubtedly on an Iceland self drive tour. Though there are now some bus tours that promise the Snæfellsnes Peninsula in a day, we’re not advocates of those any more than we are of hopping on a guided Golden Circle Tour. 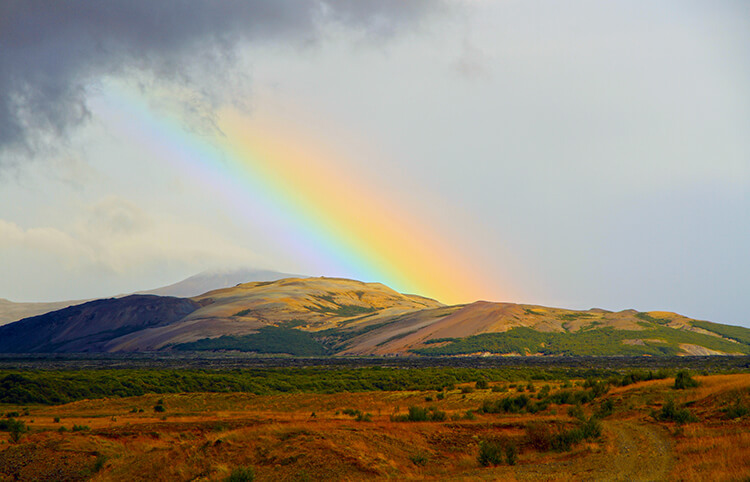 Iceland’s natural wonders are best seen when you can take the time to truly explore them and in Iceland that means getting dirty and communing with nature. Iceland has a waterfall around just about every corner and many are easily accessible as roadside attractions, but one of our favorite waterfalls is only accessible by hiking in to it. Perhaps that’s why we think Glymur, which is also Iceland’s highest waterfall, is also one of Iceland’s most special. Glymur cascades 196 meters down the deep gorge of the Botnsdalur valley. It’s best to begin a hike to Glymur at sunrise, so spend the night in either Reykjavik or on the Reykjanes Peninsula and get an early start. Tim has done the hike to Glymur twice and it’s best to hike up the shorter and easier west side trail, cross Glymur by wading across the Botnsá river and descending down the east side trail. Plan 3-4 hours for the hike. The Blue Lagoon is Iceland’s most visited attraction and the milky blue waters make for beautiful photo ops, but it’s the natural hot pots that we really love. And best of all, they’re free. Landbrotalaug is a small natural hot pot that really can’t fit more than four people in it. So if you’re venturing around with your significant other like us, it’s perfect. There’s nothing more Icelandic than soaking in one of these little hot pots in the middle of nowhere. The water is about 42°C (107°F), so it’s a nice warm temperature that’s just right. Just follow your nose to the sulfur and your eyes to the rising steam to find it about 100 meters from a little parking area that you’ll see. Use the GPS coordinates N64°49.933 W22°19.110. Icelanders were long cut off from the rest of the world and they developed a rich storytelling tradition. Elves, trolls and hidden people are often used to explain many of Iceland’s otherworldly formations. 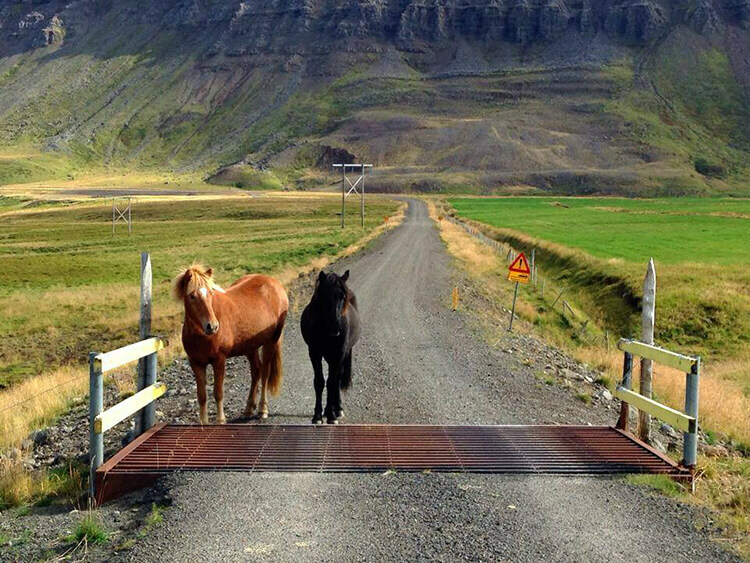 Icelanders will even build roadways around where elves, trolls and hidden people are believed to live. Huldufólk are elves or hidden people in Icelandic folklore and Icelanders believe they are everywhere. Though you can find little elf houses all around the country, our very favorite elf community is located on the Highway 54. With a church, houses, store and more, you should definitely pay a visit to the elf community in Borgarnes. Speaking of elves and trolls, Icelanders believe that Glanni waterfall on the Norðurá River is another dwelling place of elves and trolls. We don’t know about that, but the wide multi-drop river waterfall near the Grábrókarhraun lava field is on one of the richest salmon rivers in Iceland. There’s a few man-made steps in the waterfall and they’re there to help the jumping salmon have an easier time making their way up river. You might get lucky to see the sight. 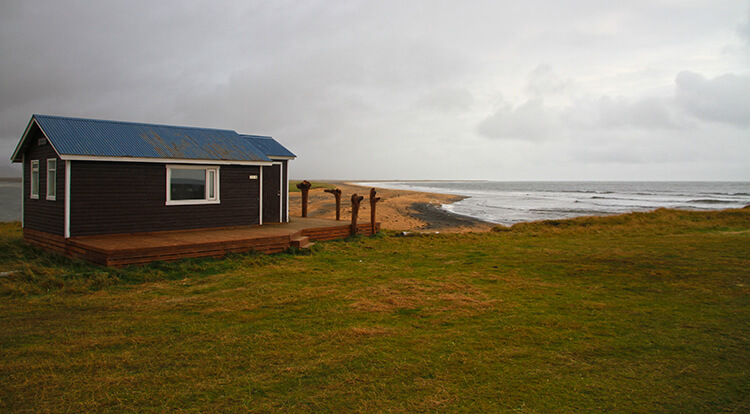 Who wouldn’t want to stay in a cabin on a golden sand beach in Iceland? Most of Iceland’s beaches are black sand and they’re beautiful. But there’s something truly special about golden stretches of sand and the chilly Atlantic Ocean crashing on to them. One of the few golden sand beaches in Iceland can be found on the Snæfellsnes Peninsula. You’ll definitely want to plan some time to put your toes in the golden sand and collect some of the colored pebbles that wash up on the shore here. Not far from Snæfellsnesvegur is Ytri Tunga, another stretch of beach in front of an abandoned farm known for its seal colony. 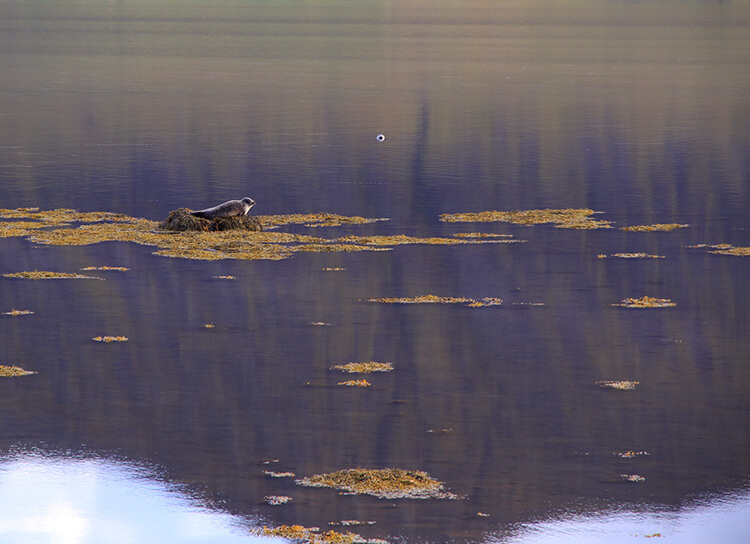 The seals, which up to seven species have been spotted on this beach and in the waters of it, like to climb up on the rocks. The best time to see them in June through August, though people have spotted some even in winter months. You can really journey to the center of the earth, just like the movie. Vatnshellir is actually an 8000 year old lava tube that stretches for 200 meters in length down 35 meters beneath the surface. Unlike Surtshellir, which you can explore on your own, Vatnshellir can only be explored on a guided tour for preservation reasons and there’s only one guide company authorized by the Iceland National Park service. But you can do the guided tour year round. Ólafsvík is charming old fishing village and Iceland’s oldest trading town, which dates back to 1687. It’s also the westernmost town in Europe and a great place to base for exploring Snæfellsnes National Park, which is just 10 kilometers away. There is plenty of birdwatching, hiking trails, long sandy beaches, and snowmobiling on the Snæfellsjökull glacier (from May – August). If you visit in the summer months, Ólafsvík is also the only place in Iceland that you can see the Whale Big Five: Blue Whale, Fin Whale, Humpback Whale, Minke Whale and Killer Whale. 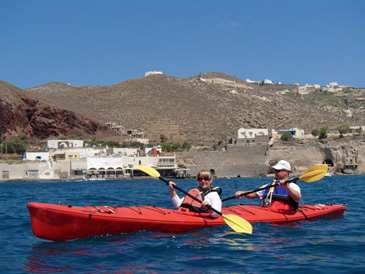 Go on a whale watching tour and see how many you can spot. Just don’t forget to dress warmly, even in summer. There are just a handful of restaurants in the town of 1100 inhabitants and if you’ve been out hiking, exploring or whale watching, a hot meal at Hraun Veitingahús hits the spot. One of the most iconic landmarks of the Snæfellsnes Peninsula, Mount Kirkjufell is a freestanding mountain standing 463 meters tall. It’s also the most photographed mountain in Iceland, so no surprise that we too wanted that perfect photo of it. If you truly want that perfect photo at Kirkjufell, either pray for good luck or plan on camping out. When we arrived, it was raining, there was a bulldozer and two excavators working on the bridge and stacks of hay bales were near the road. Yes, Kirkjufell is set just off the main highway and that famous photo you always see is taken with a wide angle lens from just the perfect angle. 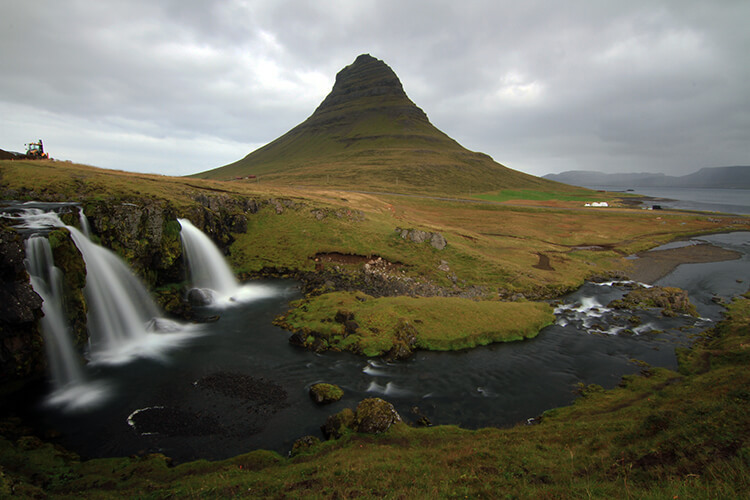 Even so, Kirkjufell and the Grundarfjörður are beautiful and well-worth the stop on your Iceland self drive tour. There are hiking trails around the mountain and you can climb Kirkjufell, though it’s recommend to climb only with a local guide. Iceland has no shortage of spectacular waterfalls, and Hraunfossar definitely belongs on any list of the most beautiful ones. Stretching for nearly a kilometer Hraunfossar, which translates to Lava Falls (and is much easier to pronouce! 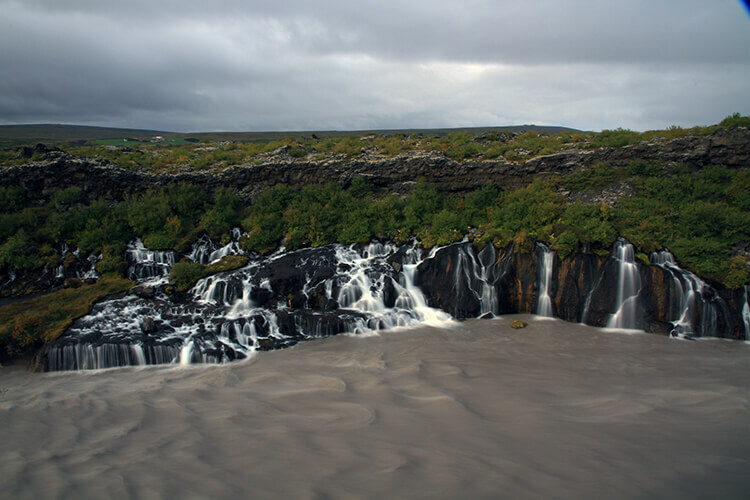 ), is actually a series of waterfalls pouring from rivulets out of the Hallmundarhraun lava field. The turquoise water gently cascades out of the lava rocks and a nice pathway allows visitors to safely take it all in from across the Hvítá River. If you continue on the wooden walkway, you can also reach the much more powerful Barnafoss. A rather horrific tale says that two little boys fell to their death from the natural stone bridge that spanned the river, and so the waterfall was named Barnafoss (Children’s Falls). An earthquake eventually destroyed the natural stone bridge and a manmade bridge now allows visitors to get a look into the churning water from the waterfall. 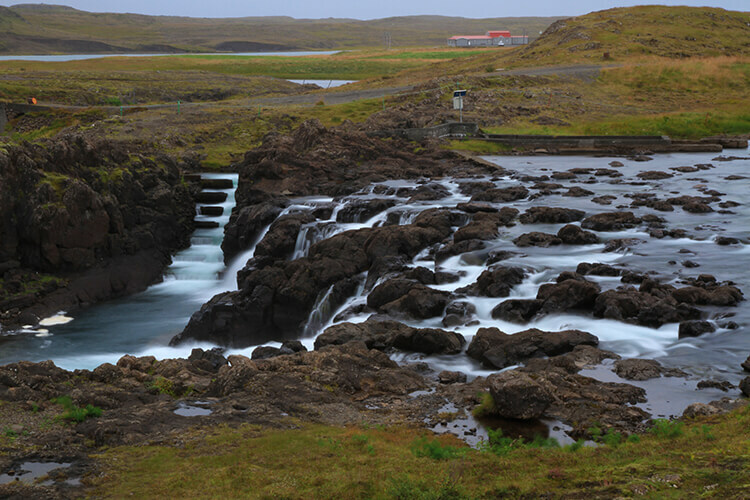 I already mentioned the Hallmundarhraun, which the 900 meter long Hraunfossar flows out from. But Hallmundarhraun, which formed from a huge eruption under Langjökull in 930, also created some of Iceland’s longest and deepest lava tubes. 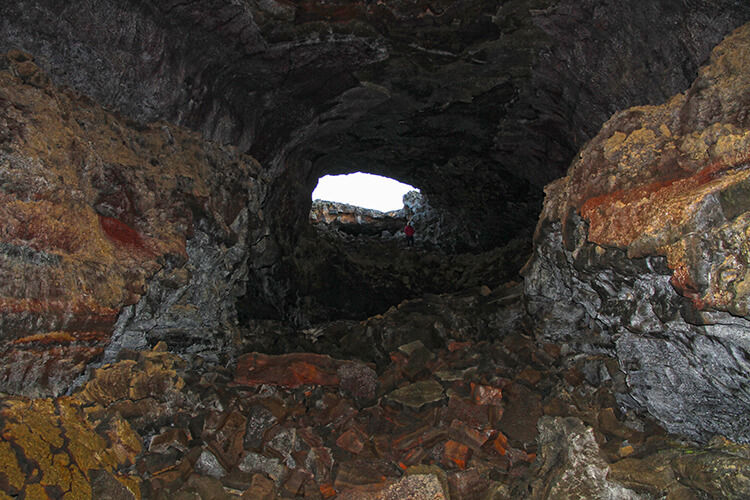 Surtshellir is the most well-known of the series of lava tube caves around Hallmundarhraun. 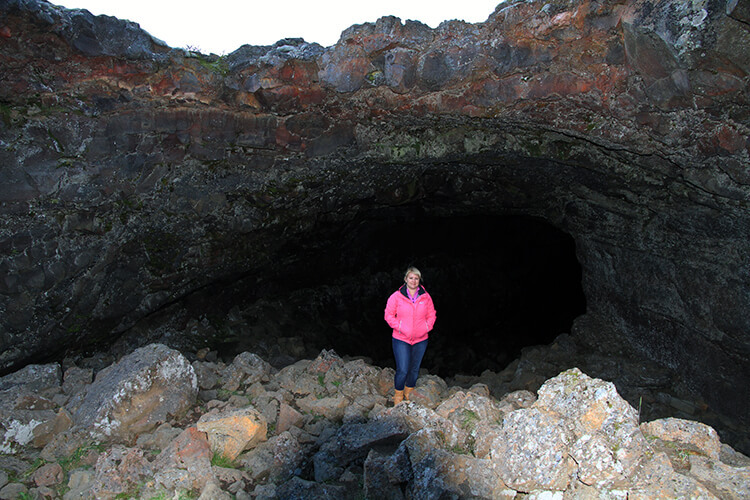 Combined with the Stefanshellir, which is separated from Surtshellir by just 30 meters, the two lava tube caves stretch for 3490 meters and are often considered as one. 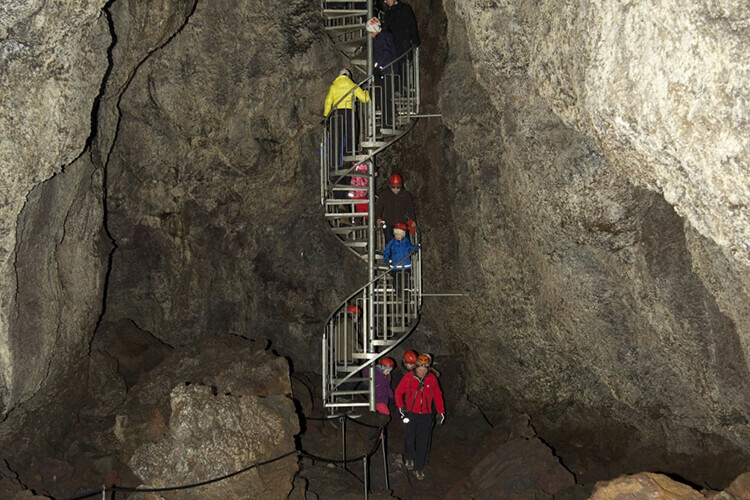 It makes them the longest lava tube in Iceland. Tim didn’t give it a second thought. Can you spot him? With 10 different entry points, or “skylights”, you can explore the lava tube cave between entry points or for the full 3490 meters. Bring a headlamp and a thirst for an adventure, climb on in and start exploring. 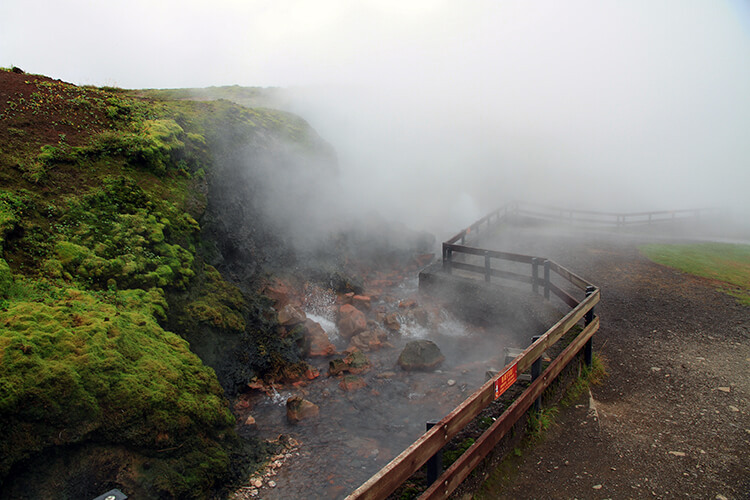 Europe’s most powerful hot spring can also be found on the Snæfellsnes Peninsula. The water at Deildartunguhver moves at 180 liters per second and is boiling at 100°C. Though you definitely can’t soak in the hot river and hot pots at Deildartunguhver, the springs provide hot water and central heating to the tows of Borgarnes and Akranes. If you take a shower anywhere within a 65 mile radius of Deildartunguhver, you’re bathing in the water from the hot spring. Walking along the springs is like getting a facial. The boiling water steams up into the air and it’s one place in Iceland you never have to worry about being cold. 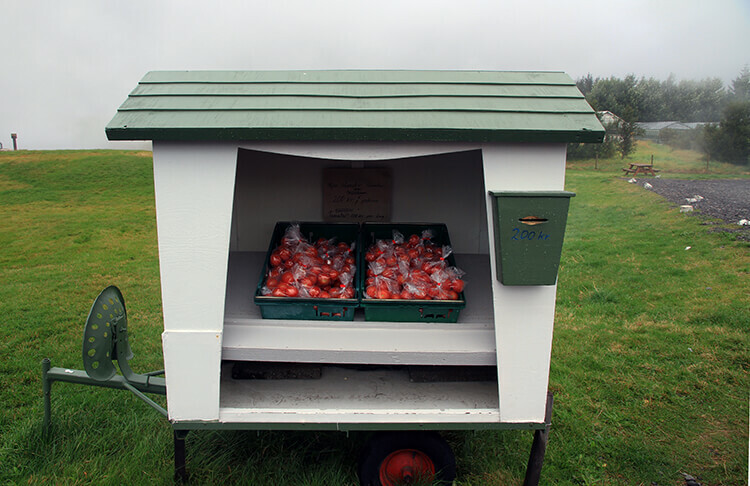 There’s also an honor system with a little shed selling tomatoes grown in the nearby farm’s greenhouse. For just 200kr (about $1.50 USD), you can take a bag of the fresh tomatoes that are replenished daily. Toll road in Iceland. The fee to pass is a carrot and a pat. Okay, Icelandic horses aren’t technically a place but we saw more Icelandic horses on the Snæfellsnes Peninsula than anywhere else in Iceland. They’ve just about the cutest horses in the world (maybe the Shetland ponies are a tad bit cuter because of their even smaller size), so you can’t not stop every time you see them. There’s just something about rubbing those fuzzy noses and getting a nuzzle from them. The Snæfellsnes Peninsula is best explored with a rental car and we highly recommend renting a camper van. We highly recommend renting a camper van. There are campsites at Husafell (excellent for exploring Surtshellir, Deildartunguhver and Hraunfossar), Grundarfjörður (email [email protected]), Ólafsvík. All campsites mentioned have shower facilities and electricity and plugs for your camper. Expect to pay around $10 per adult and $8 for electricity at campsites. Not all campsites are open year round. There are so many great waterfalls, caves, and other natural wonders I can see why you’d want to make it a road trip to take your time exploring everything! The Deildartunguhver hot springs look awesome! I also love the folklore in Iceland to explain all of these fantastic natural wonders. I’m having Iceland withdrawals already and your post makes me miss Iceland more. Not at all. We lived in Iceland for a short bit in 2011 and have been back many times. We’ll be there again in September. Icelanders are extremely friendly. Just be sure to be respectful, because there has been a rash of misbehaving tourists lately. Iceland is certainly an up and coming vacation destination. I would like to go there for the waterfalls alone. Your photos are spectacular! Such gorgeous pictures! You have succeeded in pushing up Iceland in my list. 🙂 Full of natural beauty this place is very inviting and the road trip would be the best to admire it. Icelandic horses just look like integral part of the place. How many days do you recommend for Iceland? 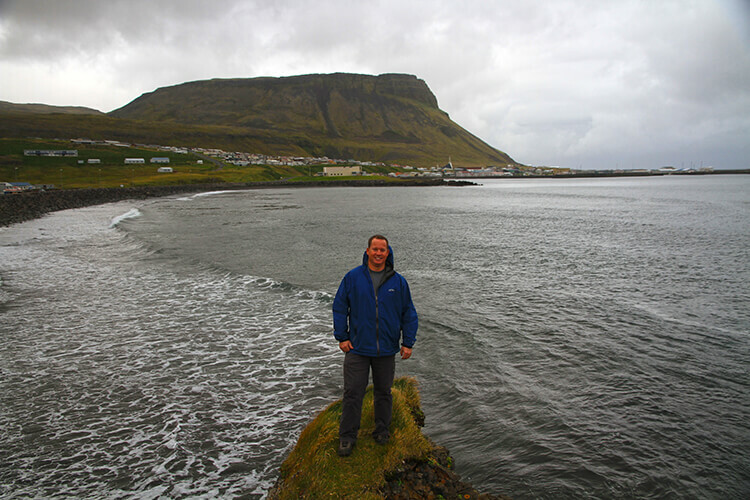 At least four full days to explore the Snæfellsnes Peninsula. We lived there briefly for work, have been back four times since and still haven’t seen it all. Iceland is just an incredibly beautiful country. Every post I read has a different sight that I must add to my list of things to see there. 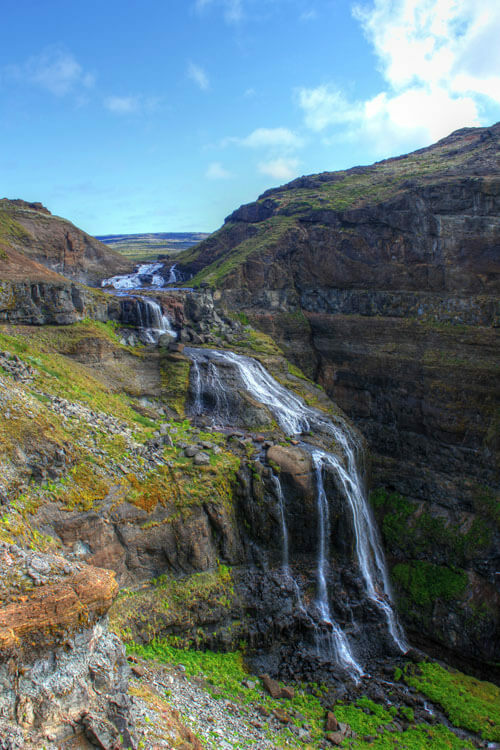 The Glymur Falls hike sounds amazing, and really, all of it would be such an adventure! Thanks for sharing your info and beautiful photos! Hey guys, thanks for this! 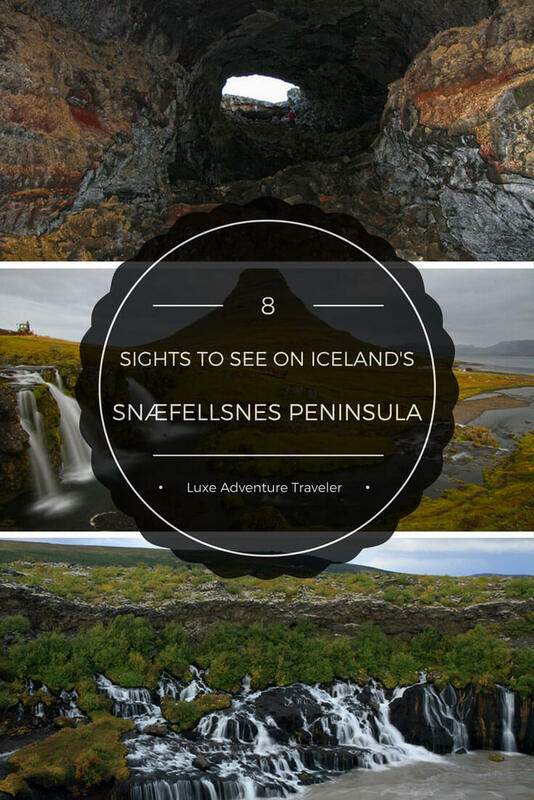 We have been to Iceland twice now but are yet to explore the Snæfellsnes Peninsula. I think I can safely say that Iceland is right up there as one of my favourite places in the world to visit. It’s so weird, starkly beautiful and friendly. I love it! 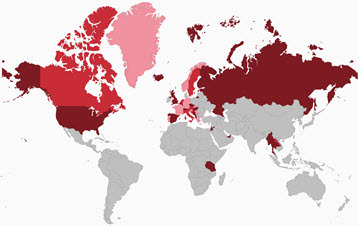 On a side note, what maps plugin do you use for your blog? I’m looking for something similar for our blog and aren’t overly happy with what I currently have. Any advice greatly appreciated. We don’t use a plugin. We make maps in Google Maps, set them to public and embed them. Your photos are absolutely gorgeous! Iceland has been on my bucket list for awhile but after reading this, I want to go even more badly! !